Purchased by a young family in the 1970’s, the former “builder’s special” beach house on the site was fighting a losing battle against the salt sea air, and was increasingly incompatible with the lifestyles of a new generation of beach-lovers. 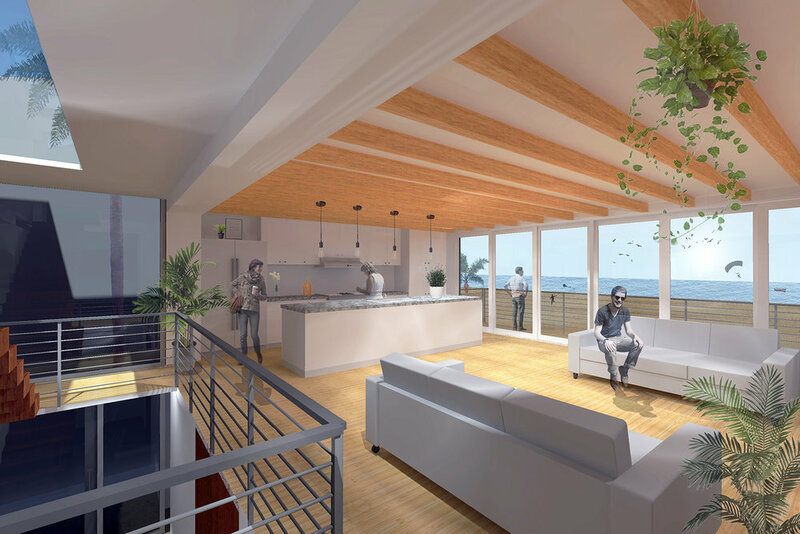 The answer was to design an entirely new home that would maximize the views of the sea and harbor, utilize ultra-low maintenance (and corrosion resistant) materials, and provide more bedrooms and spaces for both quiet and boisterous family gatherings. Pushing hard between the flood plain datum and the maximum allowed height allowed for a tight, but reasonable, three floors. Fortunately, every room has plenty of beach or harbor-facing glazing to draw the eye outward. This also creates an allusion to a spyglass pointed to the sea, which is just the right amount of nautical theme. Organized around an open, sunlight-flooded central stair, bedrooms and shared spaces open to allow interaction, while solid doors and soundproofing ensure spaces for privacy and quietude. A generous open kitchen, heated floors, luxurious bathrooms, and a laundry chute, make for very enjoyable beach weekends. Landscaping is sandy, and minimal, but small touches like a entry lined by a raised planter of low-maintenance, salt-friendly native plants, a dune interface handsomely stabilized with more plantings, an outdoor shower with warm water, and plenty of storage for beach chairs and umbrellas address the limited space and utilize it sensitively.